Zurich is regarded as the largest city of Switzerland. Zurich is considered as the major platform and hub for financial and cultural areas. The city is also referred to "Cultural Capital of Switzerland". If we take a look at the statistics of 2006 to 2008, then Zurich has the honour of being named as the city which provides the best quality of life. 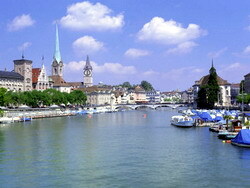 Zurich is also recognized as one of the richest city of the world. The city is also the second most expensive one in Switzerland after Geneva. The metropolitan area of Zurich is home to about 1.68 million. The climatic conditions of Zurich are typical as expected according to the season. But overall the climate is not towards the extreme side and remains somewhat mild. Summer season receives temperature ranges in between 20 - 25 degrees. Zurich mostly enjoys the rainy season during summers. Winter season is very cold in the city. The temperature can even drop to -5 degrees during nights. One most important reason for visiting Zurich is also its climatic conditions. The season in which it receives most of the tourists are the spring and autumn seasons. The seasons have a very mild and cool temperature with beautiful breezes and beautiful sun shines. In 2007 Zurich's population was approximately 358,540 people. The population of the city makes it the largest of the country and mostly consists of German inhabitants and after them is dominated by Italians. The language commonly spoken in Zurich is Zurich German. Side languages include Italian, English, Serbian, Croatian, and Spanish. Out of this population about 4 percent of the people are spending their lives on the welfare payment provided by the government because they don't have any jobs or some reliable sources to earn livelihood. In 2007 the unemployment rate of the city was approximately 2.6%. Zurich is a strong city in terms of economical factors. The stock exchange of Switzerland is also located in Zurich which is called "SIX Stock Exchange", commonly known as "SWX". There are a number of factors involved in making Zurich a strong contributor of the Swiss economy. The city is a much diversified one. Many people from different cultures and backgrounds are the residents of the city. Due to this factor many international organizations have established their headquarters in the city which includes Toyota, IBM, Google, Microsoft, eBay and General Motors. Zurich has the honour of being nominated as the city which provides highest quality of life to its residents. Zurich has a number of night clubs and bars which as a result means that the city is very lively at nights and also the nightlife is very attractive. Zurich is also a host to the world famous event called as "Street Parade". "Niederdorf is the area of Zurich which is most famous for night time enjoyment as the district is full of hotels, shopping centres, punk clubs, Brazilian bars, restaurants, and clubs. Football is the major sport in Zurich. The club which represents the city is called as "FC Zurich" which competes in the top level of Swiss football league. The club has also achieved the goal of playing regularly in the major football event UEFA Champions League. 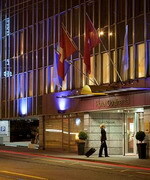 About the Author - For accommodation in Zurich check this list of Zurich hotels. The Alden Hotel Spluegenschloss is located in Zurich, Switzerland, 100 metres from Lake Zurich, and 200 metres from the famous Bahnhofstrasse, with its many designer shops. The nearest metro station is 200 metres away. Dating back to 1895, the Alden Hotel Spluegenschloss is set in a listed building with an impressive facade, retaining all its original stucco features. Complimentary newspapers are available, as is wireless Internet access. There is also a grand, dark-wood library, and a champagne bar. The Alden Hotel Spluegenschloss has a gourmet restaurant serving fusion cooking. There is also a bistro with a terrace for al fresco dining, and a champagne bar. A complimentary breakfast is served in the restaurant daily. The 22 air-conditioned suites have maple-wood parquet floors, Egyptian cotton bedding, and satin throws. Zurich's annual Street Parade, now in its 15th year, takes place in September, with 800,000 visitors taking to the streets to dance and follow the floats. Similar to Berlin's Love Parade, it is now one of Europe's largest street festivals. The Hotel Basilea in Zurich is a first-class hotel located 12 kilometers from Zurich-Kloten Airport. Situated in a great location, this property is close to several area attractions including the Kunsthaus museum of fine arts, Grossmünster church, Fraumünster church, the Zunfthäuser and Bahnhofstrasse. The hotel's 51 guest rooms were tastefully renovated in January 2000, creating a modern, up-to-date atmosphere throughout the property. Three on-site restaurants give guests of the Basilea the freedom and luxury of culinary choices. The Oepfelchammer offers traditional Swiss cuisine, the Raclette- Stube serves fondue and Skebe offers up Asian- style cuisine. Friendly and upbeat, the hotel's professional staff works to bring the most outstanding European hospitality to this quaint, inviting piece of Zurich. 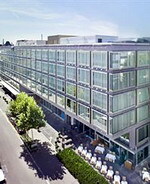 The Hotel Basilea, Zurich, is close to many dining, shopping and entertainment venues. 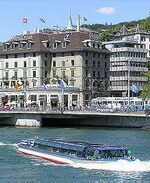 The Central Plaza Hotel, dating from the late 19th century offers a central location in Zurich, Switzerland. 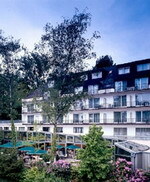 Overlooking a river and adjacent to a railway station, the hotel is located two kilometers from Lake Zurich. Zurich International Airport is approximately 11 kilometers away. The Central Plaza Hotel is a boutique property with Art Deco overtones. Stylishly renovated, public spaces boast hardwood floors, chrome and leather accents and louvered shutters. A piano bar graces the lobby area. There are two dining choices, a terrace café and the medieval- themed King's Cave, which is appropriately located in the hotel's basement. Other property amenities include a gymnasium. Zurich lies located on both shores of the Limmat River, which flows from the northern end of Lake Zurich. The Sihl River, a tributary of the Limmat, also flows through the city, and quays line the riverbanks and the lake. Built in the 1960s, the Hotel Continental Zurich features Swiss chalet-style interiors and is centrally situated, 500 metres from the downtown area and the main train station. The hotel's Bel-Etage restaurant is a wood-panelled Swiss chalet-style dining room serving a range of regional specialities and traditional French cooking, while Luo's Restaurant is located in the cellar and offers authentic Chinese cooking. Guests can enjoy discounted access to a local health centre, and rent bicycles onsite. There are conference facilities, six meeting rooms for up to 60, and wireless Internet access for business guests. Other amenities include 24-hour room service, a safe-deposit box, a porter, babysitting and dry-cleaning services, and garage and valet parking available (surcharge). Those keen to learn more about the city can enjoy a sightseeing trip on an old-fashioned trolleybus; tours depart just 250 metres from the hotel. Zurich's National Museum is also 250 metres away, and the downtown area is 500 metres away. In a residential neighborhood, deep within Zurich, Switzerland, rests the Hotel Engimatt. 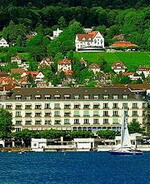 The 4-story hotel is located near old town, 500 metres from Lake Zurich. Bahnhofstrasse, a local shopping thoroughfare, and the opera house are one kilometre from the hotel. Located less than 3 kilometres from the property are Fraumunster Church and the Swiss National Museum. Furnished with black leather armchairs, the lobby of the Hotel Engimatt showcases a grand fireplace and numerous literary works. Illuminated in natural daylight from the floor-to-ceiling windows, the Orangerie serves Swiss and French dishes. The Garden Restaurant offers various fares in an outdoor garden environment. Complimentary continental breakfasts are offered daily. The hotel provides conference rooms, a business center and high-speed Internet access. Tennis courts are located adjacent to the hotel gardens. 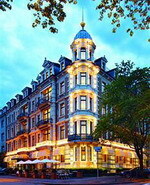 Located one kilometre from Hotel Engimatt is Bahnhofstrasse. Touted as one of the world's most expensive and elite strips, this area features famous boutiques including Dior, Louis Vuitton, Chanel and Cartier. Standing six stories tall in western Zurich is the Hotel Senator. 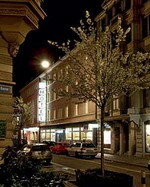 The white-faced hotel is one kilometres from the nearest railway station and Zurich's old town district. Zurich Lake and the Zurich Zoo are three kilometres from the property. The navy blue couches provide a contrast to the oatmeal-colored marble tiling in the Hotel Senator's petite lobby. Swiss, Italian and international dishes are served in the Hotel Senator's informal restaurant. Menu items include oven-baked cockerel with herbs, lasagna with vegetables and risotto with mushrooms. The hotel bar and terrace serve cocktails and light snacks. Meeting rooms and high-speed Internet access are provided by the hotel. The 120 guestrooms of the Hotel Senator feature a pastel color scheme, patterned fabrics and walnut-stained wooden furniture. Work desks are provided in each room. Standard room amenities include cable television, clock radios and high-speed Internet access. Rooms are equipped with minibars, work desks, and security safes. The Hotel Senator is located one kilometre from the tram station where a multitude of regional tours are offered. The Park Hyatt Zurich is located in Zurich, Switzerland, within 500 metres of the fashionable shopping street, Bahnhofstrasse, and Fraumunster Church. Zurich train station is one kilometre away, and Zurich airport is 10 kilometres from the hotel. This city hotel features a lobby lounge with an open fireplace, rich cherry panelling, deep sofas, and lounge seating. Complimentary use of a video library, spa, and health club are available to guests. The Parkhuus restaurant features a chandelier, floor-to-ceiling windows, a terrace, show kitchen, and two-storey wine library. International dishes are served, and seasonal local ingredients are used. The Onyx Bar offers an extensive selection of vintage wines, malt whiskies, and vodkas, as well as hand-rolled cigars from Cuba or the Dominican Republic. Afternoon high teas and freshly ground coffee is served in the lobby lounge. Complimentary access to the hotel spa, Club Olympus, is available to guests. Saunas, steam rooms, a gym, and spa, are offered. For a pleasant picturesque stroll head to the quays along the banks of the River Limmat and Lake Zurich to see gorgeous greenery, bustling boats, and a panoramic view of the Lake and Alps at Mythenquai. 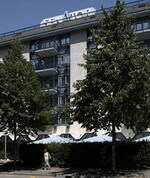 The traditional Steigenberger Bellerive au Lac hotel overlooks Lake Esplanade on Bellevueplatz in Zurich, Switzerland. The famous Opera House is less than 100 metres away. Nestled between the city and the lake, the grand five-storey Steigenberger Bellerive au Lac hotel offers a slice of old-world Zurich elegance. Multilingual staff from the 24-hour front desk can help with sightseeing trips to local attractions like the Opera House. The wood-panelled Restaurant Du Lac has lake views and serves local and international dishes. Cesar's Bistro provides an extensive wine-list and Mediterranean cuisine on a conservatory terrace with panoramic hill and lake views. The hotel's wood-panelled piano bar, the Bellerive Bar has wine and beers on the menu. All the hotel's restaurants and bars serve Cuisine Naturelle products, based on traditional Asian food science. The hotel has a well-equipped gymnasium, solarium, and sauna with multi-sensory showers. It's walking distance from the Steigenberger Bellerive au Lac hotel to two of Zurich's most famous churches, the Grossmunster and the Fraumunster. 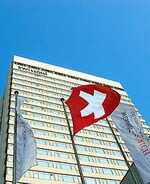 The Swissotel Zuerich in Zurich, Switzerland is in suburb of Oerlikon, opposite the Oerlikon train station. 500 meters from the hotel is the Zurich Trade. Less than 4 kilometers away is the Swiss National Museum and the Bahnhofstrsse designer shopping area. St. Peter's Church, Museum of Fine Arts and Lake Zurich are 5 kilometers away. Opposite the Swissotel Zuerich's lobby entrance are the hotel's two restaurants, bar and Starbucks coffee shop. A bakery featuring fresh croissants and snacks is located on the first floor. The Restaurant Szenario serves buffet breakfasts and lunches. In the summer, seating is available on the terrace. Restaurant Dialog is raised above the main dining. The Edison Lounge and Bar features candle-lit tables and leather chairs and offers a selection of fine cigars. The hotel's rooftop fitness center, Amrita, includes training machines, weights and steam baths. The rooftop swimming pool and jetted spa offer views of the city. More than just a street, Bahnhofstrasse is a Swiss happening. With its exclusive designer boutiques it's a paradise for those with discerning taste -- and for curious window-shoppers.